Hosting Lotus Review 2019: Is Hosting Lotus a Good Hosting? 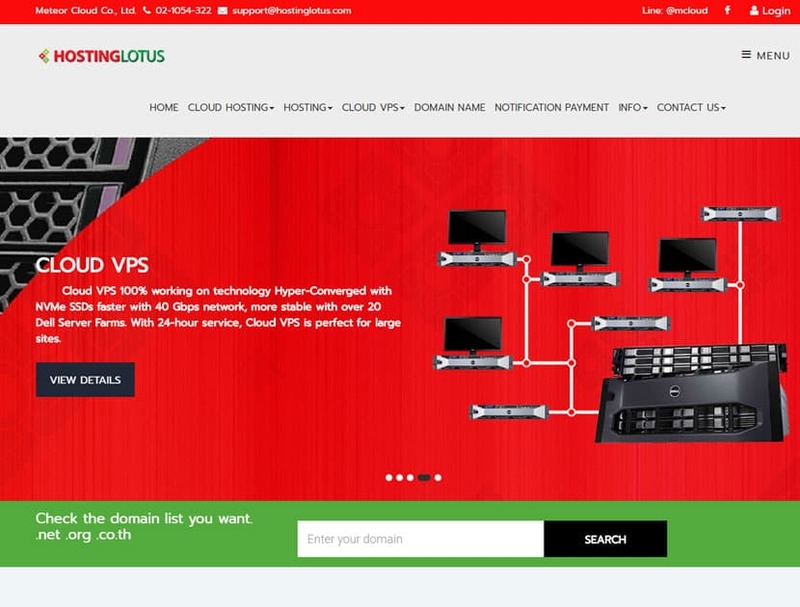 Hosting Lotus is a reputable domain registration and web hosting company with years of experience in shared, cloud, and VPS hosting. They primarily serve the Thai market, offering plans for both individuals and businesses. Hosting Lotus features a number of “unlimited” shared hosting plans: essentially, you get to pick the feature you want to have a virtually unlimited capacity of. For example, you can select unlimited databases, unlimited hosted domains under a single account, unlimited storage, or simply opt to have everything unlimited. Hosting Lotus doesn’t own their own data center. Instead, they’ve partnered with MetraBuzz Cloud Co. to lease their servers for their customer base. This data center offers a 99.9% uptime SLA; Hosting Lotus does not offer an uptime guarantee of their own. Hosting Lotus also has a number of specialized cloud hosting plans optimized for select CMSes — namely, WordPress, Moodle, and Joomla!. The features of these hosting packages are very similar, however. Plus, you’ll still have to use the one-click installer to install your desired CMS after purchasing the package; Hosting Lotus does not handle it for you automatically. It appears that the different ranges were created simply to market to specific audiences who already had those CMSes in mind. With the plans, you get a minimum of 5GB storage, 200GB monthly bandwidth, a single hosted domain, 50 email accounts, and 10 MySQL databases. Sadly, backups for your website data aren’t available — a minus when it comes to WordPress hosting — but as a consolation, you can backup your emails every week and your MySQL databases every day. There’s nothing extraordinary about the Hosting Lotus website; it’s simple and practical. I do wish they had an English version though. The current website is written entirely in Thai, which makes the service rather inaccessible to non-Thai customers. Similarly, their user interfaces, online store, and support documentation are all written in Thai. Hosting Lotus is priced affordably, but they’re not the cheapest in the market. This is especially pertinent when you consider that most hosting providers located in countries with lower GDPs tend to price their services much lower for their local markets. While Hosting Lotus seems to have done so, it appears that their packages are designed to appeal more to middle- to higher-income individuals and businesses. That said, their unlimited shared hosting and cloud hosting packages are fair offerings for business owners. These give you all the features you require to launch a content-rich website robust in functionality. Their customer support seems to be rather mixed. Pre-sales support is spectacular, with their representatives answering my queries very quickly. However, after-sales support seems to be rather lacking: their knowledge base is sparsely populated, and responses to support tickets take a while. They also have an email and telephone number you can reach them at, but bear in mind that you’ll have to communicate in Thai to use these. Hosting Lotus is a decent Thai hosting provider with solid offerings for businesses in their local market. However, they don’t have lite versions of their hosting packages or any money back guarantees, so they may not be the most suitable for businesses and individuals just starting out. Wondering how Hosting Lotus stacks up against other Web Hosting companies? Enter any other Web Hosting company and we will give you a side-by-side comparison.